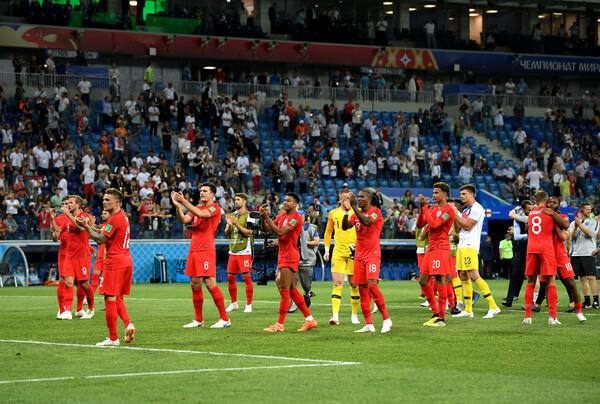 England players applaud fans after their victory during the 2018 FIFA World Cup Russia group G match between Tunisia and England at Volgograd Arena on June 18, 2018 in Volgograd, Russia. We’ve been spot on with our predictions in the past few days and we’re pleased to deliver the latest edition which sees three fixtures. First up is the three lions up against World Cup debutants Panama, David and Goliath in all regards. The English national team has had a fair share of challenges, from the Raheem Sterling saga to the inevitable Dele Alli omission and of course the team sheet leakage, in all they have managed to weather the storm and stay focused. The victory over Tunisia wasn’t pretty but it keeps them in place for the next round, a victory here guarantees qualification while they slug it out with Belgium who have a rich goal difference at the moment after blowing off Panama and Tunisia in quick succession. Panama fought hard within their might against Belgium but the quality the Red Devils shot them down, how much of energy can they exert on this fixture? No star player, just a hard-working bunch with high spirit. England are expected to win here, and comfortably too, Harry Kane would be looking to add to his brace against Tunisia with another strong showing here; early goal is the key, and patience if it doesn’t come early. Panama can work out Mathematics, should they beat England here and Belgium beat England, anything can happen. The pressure is on England here but nothing will go wrong.